These Lemon Blueberry Cheesecake Bars are absolutely heavenly! They have such a fresh and delicious flavor. This will be one recipe you will want to make over and over again! Lemon and Blueberry are one of my personal favorite flavor combinations. It provides such a fresh and delicious flavor. Paired with cheesecake, it makes one heavenly dessert! 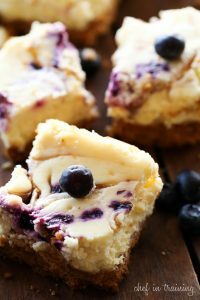 These Cheesecake Bars were so simple and absolutely divine! I loved how easy it was to make and the end product was enjoyed by all who tried it! It is such a beautiful dessert with the streaks of purple/blue blueberries swirled throughout. If you are looking for a perfect treat, give this one a try! It will be one you want to make over and over again! Preheat oven to 325 degrees F. Spray an 8x8 baking dish with cooking spray. Mix graham cracker crumbs, butter, and sugar together in a medium mixing bowl and then press down into the baking dish and bake at 325 degrees F for 10 minutes. After 10 minutes, remove from oven and let cool. In a medium mixing, bowl beat cream cheese and sugar. Add eggs one at a time, beating in each egg. Add lemon zest and lemon juice and beat again. Pour over graham crust. Place blueberries and sugar in a blender and blend until smooth. Spoon blueberry mixture into several spots onto the filling mixture. Use a knife to swirl. Bake at 325 F for 35 to 40 minutes. Cool completely then refrigerate for 3 hours before serving. yes, so sorry about that typo. It is updated now :) Thanks for catching that! Love when I can pin recipes to save them ! Hi Nikki! My name is Ruby and I'm 9 years old. I'm learning how to cook and I made these today with my grandma Jane and they are awesome!! She made a blueberry sauce to serve on the top which made them even more incredible! She has a blog, too-Cottage at the Crossroads. Thank you for the recipe. I had trouble with giving it a 5 star rating! Hope it works this time!